February 1, 2016 by fmgarchitects. The stairs in this protected Georgian building had suffered from movement caused by settlement of the party to the adjoining building during basement works. 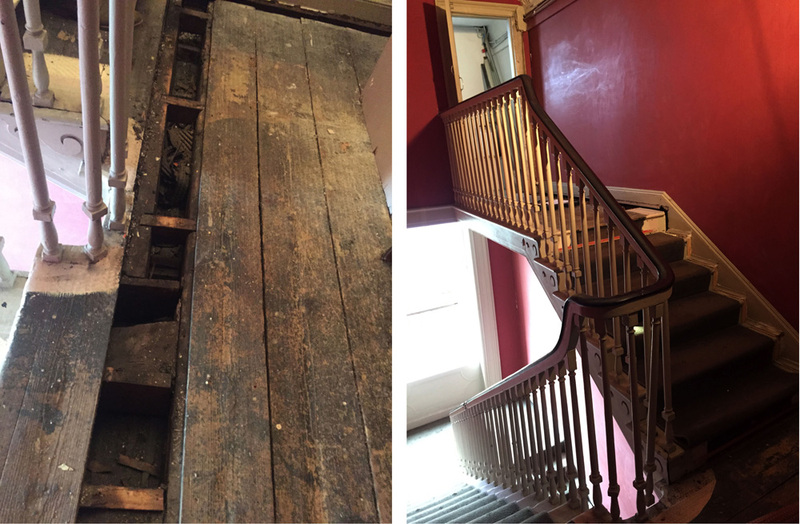 The top flight was a particular concern – this section of stairs was a later addition to a c19th century toilet addition over the stair landing. Opening up showed that the joists had poor bearing on the existing walls. The bearing of the stairs was improved by the addition of secondary joists placed into new pockets in the party wall with the existing timbers retained. The stairs was stabilised by means of an additional landing trimmer timber fixed to the exising stair stringer and a plate stiffener at the stair/landing junction concealed within the stairs. A cosmetic splice repair of the stair treads which had detached from the wall skirting was also carried out. Love these old elegant staircases. Great to see them listed and refurbished. Even the joists and trimmers are usually mortised & tusk tenoned together. No joists hangers in them days!